I have never been a big bread eater, at least not the loaf bread variety. I prefer breads with a little more body and preferably freshly baked. I buy wheat bread mostly for my husband, who can’t have a meal without bread, and for the girls who use them to make sandwiches for their school lunch. Double Fiber – we all know how important having enough fiber is to having a healthy digestive system. A high fiber diet is supposed to lower the risk for heart diseae, high cholesterol, cancer diabetes and diverticular disease. It also aids in weight loss as it makes you feel fuller longer. Double Protein – protein is important to building, maintaining and repairing body tissues. We all need protein. It is a good source of energy and controls metabolism. 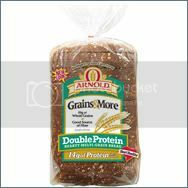 Arnold Double Protein bread provides 14g Protein in 2 slices (equivalent to protein in 1 hamburger); a great start to fulfilling the 40-60 grams required daily for most adults. Double Oat – oats are proven to be a good source of fiber and have cholesterol lowering properties. They are made from whole grains and without any fructose syrups as are the other Grains and More breads. 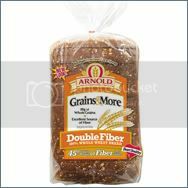 Double Omega – Two slices of this Grains and More bread contains 100mg Omega-3. Omega 3 is commonly found in fish oil and is very good for your heart health. We recently tried out these two varieties and even not knowing all the nutritional and health benefits, the whole family loved the flavor and texture of these breads. We checked our local grocery store if they started carrying these yet, but unfortunately, they’re not available yet. They are newly released, Arnold Bread just launched them on the later part of September so I’m sure they will be in our little market soon. I’m going to to the market later today and I’ll be sure to look for them again. Have you tried Miracle Muffins? are a great way to help manage diabetes, lower cholesterol and aid with weight loss! I love the multigrain breads too. Great article.